Khalil, Elias L. Feltovich, Nick and Brañas-Garza, Pablo 2018. Moral licensing, instrumental apology and insincerity aversion: Taking Immanuel Kant to the lab. PLOS ONE, Vol. 13, Issue. 11, p. e0206878. Clemens, Michael A. 2018. Testing for Repugnance in Economic Transactions: Evidence from Guest Work in the Gulf. The Journal of Legal Studies, Vol. 47, Issue. S1, p. S5. Schilke, Oliver and Rossman, Gabriel 2018. It’s Only Wrong If It’s Transactional: Moral Perceptions of Obfuscated Exchange. American Sociological Review, Vol. 83, Issue. 6, p. 1079. Munger, Michael C. 2018. 30 years after the nobel: James Buchanan’s political philosophy. The Review of Austrian Economics, Vol. 31, Issue. 2, p. 151. Munger, Michael 2017. Objections to Euvoluntary Exchange Do Not Have “Standing”: Extending Markets Without Limits . The Journal of Value Inquiry, Vol. 51, Issue. 4, p. 619. McClure, James and Watts, Tyler 2016. The Greatest Externality Story (N)ever Told. The American Economist, Vol. 61, Issue. 2, p. 157. Guzmán, Ricardo Andrés and Munger, Michael C. 2014. Euvoluntariness and just market exchange: moral dilemmas from Locke’s Venditio. Public Choice, Vol. 158, Issue. 1-2, p. 39. Rossman, Gabriel 2014. Obfuscatory Relational Work and Disreputable Exchange. Sociological Theory, Vol. 32, Issue. 1, p. 43. Shughart, William F. and Thomas, Diana W. 2014. WhatDidEconomists Do? Euvoluntary, Voluntary, and Coercive Institutions for Collective Action. Southern Economic Journal, Vol. 80, Issue. 4, p. 926. Håkansson, Andreas 2014. What is overconsumption? - A step towards a common understanding. International Journal of Consumer Studies, Vol. 38, Issue. 6, p. 692. 1 Versions of this apparent paradox have been described variously by Ferguson, Adam, An Essay on the History of Civil Society (1767), available on the Web site of the Constitution Society, http://www.constitution.org/af/civil.htm; Mandeville, Bernard, The Fable of the Bees or Private Vices, Publick Benefits, 2 vols., with a commentary by F. B. Kaye (Indianapolis, IN: Liberty Fund, 1988), http://oll.libertyfund.org/title/1863; and Smith, Adam, An Inquiry into the Nature and Causes of the Wealth of Nations, vol. I, ed. Campbell, R. H. and Skinner, A. S., vol. II of the Glasgow Edition of the Works and Correspondence of Adam Smith (Indianapolis, IN: Liberty Fund, 1981), http://oll.libertyfund.org/title/220. 2 The Greek prefix “eu-” means good, well, true, or pleasing. Thus, “euvoluntary” captures the meaning of being essentially or truly voluntary, as well as being good for or pleasing to both parties to the transaction. 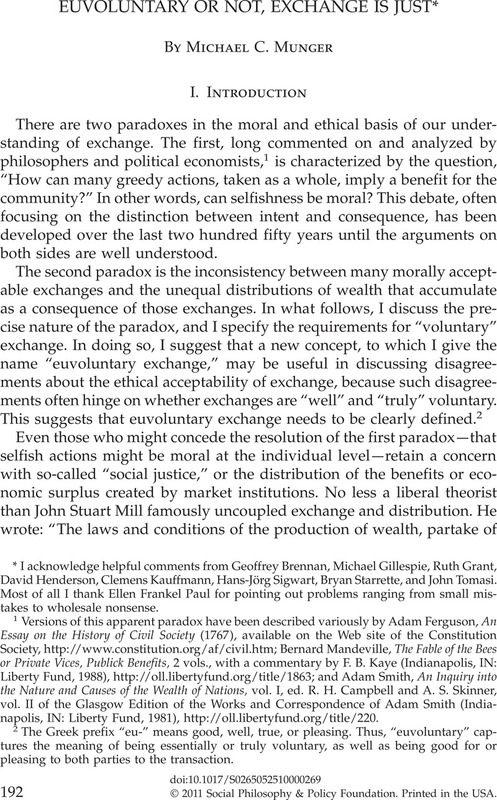 3 Mill, John Stuart, The Collected Works of John Stuart Mill, Volume II—The Principles of Political Economy with Some of Their Applications to Social Philosophy (Books I–II), ed. Robson, John M., Bladen, introduction by V. W. (Toronto: University of Toronto Press; London: Routledge and Kegan Paul, 1965), http://oll.libertyfund.org/title/102/9661. 4 Rawls, John, A Theory of Justice (Cambridge, MA: Harvard University Press, 1971), 303–5. 5 Perhaps the earliest modern statement of the consequences of individual decisions for the justice of the overall distribution was Locke, John's 1695 “Venditio,” reprinted in Wooten, David, ed., John Locke: Political Writings (Cambridge: Hackett Publishing Company, 2003), 442–46. My own view is probably closest to that argued by F. A. Hayek: “There can be no test by which we can discover what is ‘socially unjust’ because there is no subject by which such an injustice can be committed, and there are no rules of individual conduct the observance of which in the market order would secure to the individuals and groups the position which as such (as distinguished from the procedure by which it is determined) would appear just to us. It does not belong to the category of error but to that of nonsense, like the term ‘a moral stone’.” Hayek, Friedrich A., Law, Legislation, and Liberty, Volume 2: The Mirage of Social Justice (Chicago: University of Chicago Press, 1978), 78; emphasis in the original. There are clearly problems with this view, and, as John Tomasi points out, it is hard to claim that even Hayek believed it fully. See Tomasi, John, “Hayek on Spontaneous Order and the ‘Mirage of Social Justice,’” (New York: Hayek Lecture, Manhattan Institute, June 20, 2007). See also Galston, William, Justice and the Human Good (Chicago: University of Chicago Press, 1980); Gaus, Gerald F., The Modern Liberal Theory of Man (New York: St. Martin's Press, 1983); and Gaus, Gerald F., “Property, Rights, and Freedom,” Social Philosophy and Policy 11, no. 2 (1994): 209–40. 6 Marx, Karl, Capital: A Critique of Political Economy (1867), trans. Fowkes, Ben (New York: Penguin, 1992). The Marxist conception of class has both objective and subjective elements, the complete treatment of which is well beyond the scope of the present essay. 7 For exchange to be voluntary, it must also be true that there are no large-scale or dangerous externalities. In a private property regime with small numbers, this assumption is easily met by Coasen bargaining. If property is common and numbers are large, however, state action may be required. But this is more a problem with the property rights regime than with exchange itself. See Coase, Ronald, “The Problem of Social Cost,” Journal of Law and Economics 3 (1960): 1–44. The problem of conceiving of “property” in this context is illustrated by Eric Mack's imaginative article on blackmail. Mack, Eric, “In Defense of Blackmail,” Philosophical Studies 41, no. 2 (1982): 273–84. 8 Black, Henry C., A Treatise on the Rescission of Contracts and Cancellation of Written Instruments (Kansas City, MO: Vernon Law Book Co., 1916), chaps. 2, 4, and 5. 10 Thomas Hobbes argued that coercion must be relegated to government, not to private bargaining, because “covenants being but words, and breath, have no force to oblige, contain, constrain, or protect any man, but what it has from the public sword….” Hobbes, Thomas, Leviathan (New York: Penguin Classics, 1982), Part Two, chapter XVIII, p. 44. 11 This concept of the “Best Alternative to a Negotiated Agreement,” or BATNA, comes from Fisher, Roger and Ury, William L., Getting to Yes: Negotiating Agreement without Giving In (Boston, MA: Penguin Books, 1981). 12 This example highlights another feature of markets, one that economists call “consumer surplus.” If I am denied water, I will die. But if I am denied one opportunity to purchase water, my welfare is little affected, as long as there are other competing opportunities to purchase water. This idea that competition creates value for the consumer, in ways not reflected in prices, is called the “diamonds and water” paradox. See, e.g., Adam Smith, The Wealth of Nations, 31–32. 13 Turner, Sharon, The History of the Anglo-Saxons, 6th ed. (London: Longman, Rees, Orme, Brown, Green, and Longman, 1836), 115–16. Portions of this discussion are adapted from Munger, Michael, “Market Makers or Parasites?” (Indianapolis, IN: Liberty Fund, EconLib, 2009), http://www.econlib.org/library/Columns/y2009/Mungermiddlemen.html. 14 See, e.g., Greif, Avner, Institutions and the Path to the Modern Economy: Lessons from Medieval Trade (New York: Cambridge University Press, 2006). 15 Nozick, Robert, Anarchy, State, and Utopia (New York: Basic Books, 1974), 163. 16 Radford, R. A., “The Economic Organisation of a P.O.W. Camp,” Economica 12, no. 48 (November 1945): 189–201. 18 Aristotle makes this distinction most clearly, in arguing that value in use is different from, and superior to, value in exchange. Aristotle, , Politics, ed. Sinclair, and trans. Thomas Alan and Saunders, Trevor J. (New York: Penguin Classics, 1981), Book I. And this is precisely the origin of the “labor theory of value” that finds its way through the neoclassical economists into the work of Marx. 19 Radford, “The Economic Organisation of a POW Camp,” 198–99. 20 Bastiat, Frédéric, That Which Is Seen, and That Which Is Not Seen (Paris, 1850); reprinted by Liberty Fund, http://www.econlib.org/library/Bastiat/basEss1.html, chap. 6, sec. 1.99. 22 This example is adapted from Munger, Michael, “They Clapped: Can Anti-Gouging Laws Prohibit Scarcity?” (Indianapolis, IN: Liberty Fund, 2007), http://www.econlib.org/library/Columns/y2007/Mungergouging.html. 23 The text of the law at the time read as follows: “(a) It shall be a violation of G.S. 75-1.1 for any person to sell or rent or offer to sell or rent at retail during a state of disaster, in the area for which the state of disaster has been declared, any merchandise or services which are consumed or used as a direct result of an emergency or which are consumed or used to preserve, protect, or sustain life, health, safety, or comfort of persons or their property with the knowledge and intent to charge a price that is unreasonably excessive under the circumstances.” The law was amended in August 2006 to be even more restrictive, outlawing price changes reflecting cost increases up the supply chain. See North Carolina SL2006-245, General Statutes 75-38. A much broader and more careful treatment of these issues can be found in Zwolinski, Matt, “The Ethics of Price Gouging,” Business Ethics Quarterly 18, no. 3 (July 2008): 347–78. 24 Marx, Capital, Book I. 25 Ibid., Book I, chapter 26. Adam Smith used the phrase “previous accumulation” to refer to this phenomenon (Wealth of Nations, Book 2, chap. 3). 26 Euripides, in the Phrixus Fragment 970, said: “The gods visit the sins of the fathers upon the children.” Collard, Christopher and Cropp, Martin, trans., eds. and, Euripides: Volume VIII: Oedipus-Chrysippus, Other Fragments (Cambridge, MA: Harvard University Press, Loeb Classical Library, 2009), 436. 27 The relation between liberalism and Marx's theory of exploitation is rather complex, and beyond my scope in this essay. But see Buchanan, Allen, “Exploitation, Alienation, and Injustice,” Canadian Journal of Philosophy 9, no. 1 (March 1979): 121–39; and Buchanan, Allen, Marx and Justice: The Radical Critique of Liberalism (London: Methuen, 1982) for an extensive critical review. Finally, a fascinating short story of the industrial revolution and the artistic sensibility, written by Herman Melville, asks whether it is possible for an individual simply to “prefer not” to participate in markets. Melville's character Bartleby repeatedly states that he would just rather not sell his labor, even if the alternative is to be sent to the madhouse. Melville, Herman, “Bartleby, the Scrivener: A Story of Wall Street,” Putnam's Magazine, Part I, November 1853, pp. 546–50; Part II, December 1853, pp. 609–16. 28 Freeman, Samuel, Rawls (New York: Routledge, 2007), 262–64. See also Rawls, John, Political Liberalism (New York: Columbia University Press, 1993); Spragens, Thomas, Civic Liberalism: Reflections on Our Democratic Ideals (New York: Rowman and Littlefield, 1999); and Lomasky, Loren E., “Liberalism Beyond Borders,” Social Philosophy and Policy 24, no. 1 (2007): 206–33. 29 See, e.g., Acemoglu, Daron and Robinson, James, Economic Origins of Dictatorship and Democracy (New York: Cambridge University Press, 2005). 30 Stigler, George, “The Theory of Economic Regulation,” Bell Journal of Economics and Management Science 3 (1971): 3–18; Posner, Richard A., “Theories of Economic Regulation,” Bell Journal of Economics and Management Science 5 (1974): 335–58. 31 See, e.g., Peltzman, Sam, “Constituent Interest and Congressional Voting,” Journal of Law and Economics 27 (1984): 181–213. 32 Lowenfish, Lee, Branch Rickey: Baseball's Ferocious Gentleman (Lincoln: University of Nebraska Press, 2007). 33 Keynes, John Maynard, The Economic Consequences of the Peace (1919; London: General Books, 2009), 236. * I acknowledge helpful comments from Geoffrey Brennan, Michael Gillespie, Ruth Grant, David Henderson, Clemens Kauffmann, Hans-Jörg Sigwart, Bryan Starrette, and John Tomasi. Most of all I thank Ellen Frankel Paul for pointing out problems ranging from small mistakes to wholesale nonsense.